Scoring Average by Par and Yardage is the average hole score grouped by par and yardage, such as Par 3 holes with a distance from the tee between 176 - 255 yards. 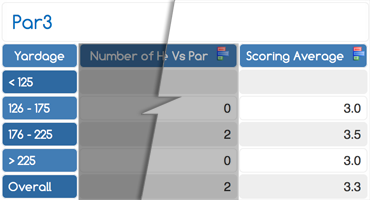 This stat shows the performance difference a golfer has at different hole lengths and can be found on the Dashboard and in the Score Report under the column heading Scoring Average. On the Dashboard this stat is graphed along with the PGA Tour Average as a benchmark.